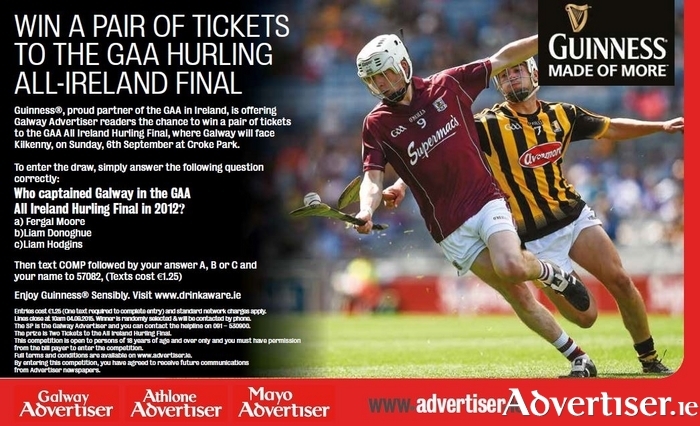 Guinness®, proud partner of the GAA in Ireland, is offering Galway Advertiser readers the chance to win a pair of tickets to the GAA Hurling All Ireland Final, where Galway will face Kilkenny, on Sunday, 6th September at Croke Park. Who captained Galway in the GAA All Ireland Hurling Final in 2012? - Entries cost €1.25 per entry (One text required to complete entry ) and standard network charges apply. - Lines close at 10am 04.09.2015. Winner is randomly selected & will be contacted by phone. - The SP is the Galway Advertiser and you can contact the helpline on 091 – 530900. - The prize is Two Tickets to the GAA Hurling All-Ireland Final 2015. - This competition is open to persons of 18 years of age and over only and you must have permission from the bill payer to enter the competition. - By entering this competition, you have agreed to receive future communications from Advertiser newspapers.